Computer networking is a major research discipline in computer science, electrical engineering, and computer engineering. The field has been actively growing, in terms of both research and development, for the past hundred years. This study uses the article content and metadata of four important computer networking periodicals—IEEE Communications Surveys and Tutorials (COMST), IEEE/ACM Transactions on Networking (TON), ACM Special Interest Group on Data Communications (SIGCOMM), and IEEE International Conference on Computer Communications (INFOCOM)—obtained using ACM, IEEE Xplore, Scopus and CrossRef, for an 18-year period (2000–2017) to address important bibliometrics questions. All of the venues are prestigious, yet they publish quite different research. The first two of these periodicals (COMST and TON) are highly reputed journals of the fields while SIGCOMM and INFOCOM are considered top conferences of the field. SIGCOMM and INFOCOM publish new original research. TON has a similar genre and publishes new original research as well as the extended versions of different research published in the conferences such as SIGCOMM and INFOCOM, while COMST publishes surveys and reviews (which not only summarize previous works but highlight future research opportunities). 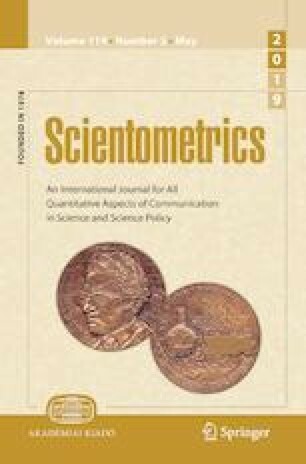 In this study, we aim to track the co-evolution of trends in the COMST and TON journals and compare them to the publication trends in INFOCOM and SIGCOMM. Our analyses of the computer networking literature include: (a) metadata analysis; (b) content-based analysis; and (c) citation analysis. In addition, we identify the significant trends and the most influential authors, institutes and countries, based on the publication count as well as article citations. Through this study, we are proposing a methodology and framework for performing a comprehensive bibliometric analysis on computer networking research. To the best of our knowledge, no such study has been undertaken in computer networking until now.